Hey Big "D".... its time to get Happy! Well of course everyone is happy...but its time to have another DALLAS AREA HAPPY HOUR!!! We've scheduled Friday Dec 16, 2016 in Addison our NEXT HH aka Happy Hour!!! Why? Cuz the Wench (that's me) can be there and because we are going to reconnect with some peeps from our early days...YEP...all the way back to when we were born! So come check us out... never met anyone from the club? PLEASE COME SAY HI!!! Haven't seen anyone from the old days? Then check in and catch up! We'd love to have EVERYONE JOIN US!!! The Appetizers are FREE and Dinner has great affordable options! Yeah the time is a bit tough but hopefully you can get out a bit early and join us! We won't leave at 7...we just need to clear the party room so will move to the bar area. 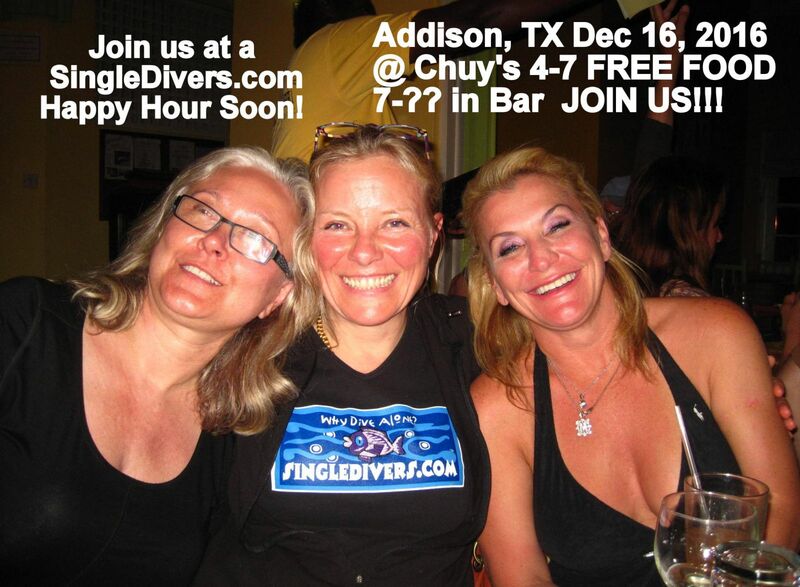 NOTE: Since SingleDivers.com was born in Dallas, we have invited some of our early friends to join us one of whom is a dear friend of mine Tami who now has a cool non-profit helping people obtain affordable housing, and has offered to co-host the HH. We are excited to meet our NEW members wanting to check us out and reconnect with some of our ORIGINAL members from 13 years ago when we first started! Cool! Please come hang out and say 'hi'! Edited by dive_sail_etc, 16 December 2016 - 10:43 AM. Maybe it is... and definitely I hope!!! SUHWEET!!! That would be a GREAT HOP!!! I'll put you on the list! Are you bringing your lovely better half? Either way is great! Its been too long! AND we are DEFINITELY EXCITED!!! Thanks Rona and welcome to SingleDivers.com! You are on the attendee list, but it is a good idea to check back here as the HH date approaches for any special info we need to share. Again, welcome! Mike aka Aireater and diving friend We will be there!